Best electric skillets are the electric skillets which have a nonstick cooking surface, sizeable enough to cook food at least for four people, and comes with a temperature regulator and a glass lid to cover the food after cooking. There are thousands of electric skillet which are available in the market, Now the question is which of these electric skillets have the above properties. The below list comprises the best electric skillet for frying, grilling, baking, roasting and making one-dish meals for family and guests. This list reviews all kind of frying pan including ceramic pan, stainless steel pan, Teflon pan, etc. 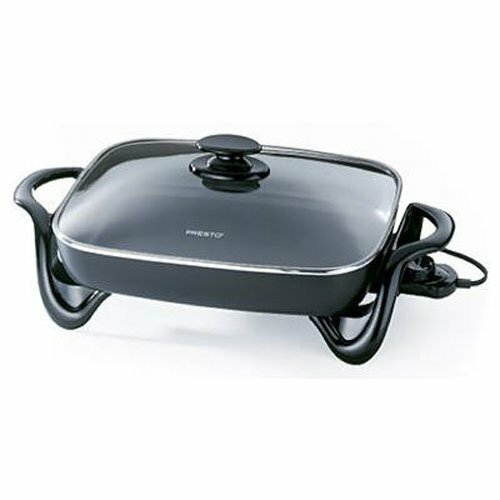 The Presto 06857 Electric Skillet can be used for frying, grilling, baking, roasting, or making any one-dish meals. It has a uniform heating non-stick surface, high-tech temperature regulator, extra-high sidewalls, and the most attractive thing about this skillet is its foldable base. This electric frying pan has a heavy cast aluminum base. The aluminum is a very good heat conductor, it conducts ten times more heat than stainless steel. Hence, the food in this electric skillet will be cooked uniformly and quickly. The Presto 06857 Electric Skillet has a temperature regulator. You can use this temperature regulator to set the temperature suitable for the dish you are cooking. You can regulate the temperature from warm to 400º. The high-tech base maintains the temperature to keep the food warm when set to warm. This electric skillet has 12 inches wide and 16 inches long cooking surface which is enough to cook the food for a big family. It is very important to have proper depth of sidewall even if the cooking surface is large because the depth of the cookware gives you the independence to stir while cooking. This electric skillet has the depth of 3 inches which keep your food safe in the pan while you stir it. The Presto Foldaway Skillet has a foldable base which fits in the pan and gets covered by the glass lid. Both the base and the pan are water immersible i.e. after removing the temperature regulator, you can wash them in your dishwasher. This electric frying pan includes a glass lid with it to cover. A small open space in pan’s covering provides spoon resting feature while cooking and serving. The product is best for cooking breakfast, lunch, dinner or any occasion one meal. Nonstick coating doesn’t last very long. Easy and compact to store. Spout for pouring water and spoon rest. Presto 06852 has a deluxe nonstick surface, perfect size, energy efficiency and is dishwasher safe. 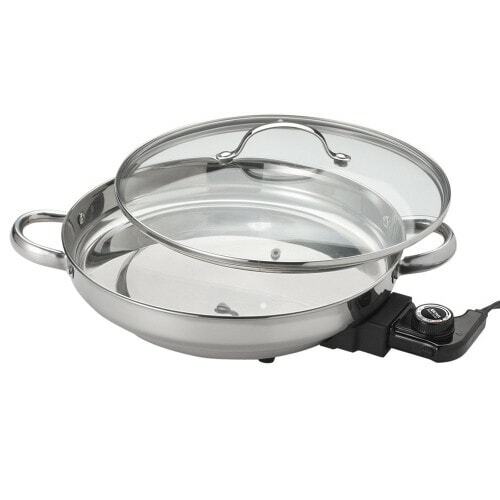 This skillet also includes a temperature regulator and a glass lid. This electric skillet has deluxe non-stick surface inside and outside as well. This non-stick surface makes cooking easy and washing the skillet will be easier than ever, because the inner surface as well as the outer surface of the pan won’t stick any food on them. This skillet includes a temperature regulator to change the temperature according to the need of the dish you are cooking in the pan. It allows you to regulate the temperature from warm to 400º. This temperature regulator is removable and is attached to the electric cord. After removing the temperature regulator, the whole electric skillet is water immersible i.e. you can use a dishwasher to wash the Presto 06852 Electric Skillet. It measures 16 x 12 x 3 inches. This skillet also has high sidewalls of 3 inches, this makes stir food in the pan convenient. The size of Presto 06852 Electric Skillet is enough to cook for a big family. This electric skillet also includes a glass lid to cover the pan. The power consumption of this electric skillet is lesser than any range burner or oven. It works on 1500 watts power when heating at maximum temperature. You can use this skillet as a handy buffet server while hosting a small house party. This jumbo size electric pan cooks almost every kind of food and is best for a family. Dishwasher safe after removing prob. Cuisinart CSK-250W Green Gourmet non-stick electric skillet is a perfect skillet for you and is a bit easy on the environmental front. This amazing electric skillet by Cuisinart is made up of stainless steel with a non-stick interior. The skillet is equipped with a petroleum-free and ceramic-based cooking surface to keep your family’s health safe. This allows you to have a surface free of polytetrafluoroethylene(PTFE) which helps protect from the harmful chemicals which get released while cooking from skillets. The product comes with adjustable heat. The easy temperature change mechanism of the product allows you to cook the dishes perfect with as less oil as possible. The size of this Cuisinart green gourmet electric skillet is perfect for a family’s serve. The dimensions being 17.17 x 18.18 x 7.28 inches are perfect for a good big family. This skillet provides a 14-by-14 inch cooking surface which is more than enough for a one-time serve. The electric skillet is equipped with a tempered glass lid, which helps you to cook food quickly and also use the skillet as a serving bowl once the food is cooked. It also comes with a stainless-steel handle which doesn’t get hot easily to allow you to handle the skillet efficiently. Additionally, this skillet from Cuisinart is dishwasher-safe with probe removed. This allows you to easily clean the skillet without any hassle. The product is built to North American electric Standards which ensures the best quality of it and also ensures good material. The power consumption of this electric skillet is lesser than any range burner or oven. It works on 1800 watts power when heating at maximum temperature. 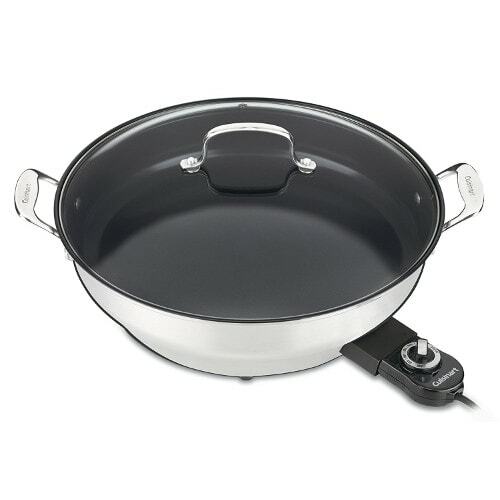 This perfectly sized electric pan cooks almost every kind of food and can be used to fry, deep fry, roast or anything. Ceramic base for healthy cooking. Stainless steel handles for safe transport. The Delonghi BG45 Electric Skillet is known because of even and efficient cooking in less time, lightweight, and its adjustable steam vent. The Delonghi BG45 Electric Skillet is made of die-cast aluminum. Aluminum is a good conductor of heat. It can conduct approximately five times more heat than stainless steel. Due to the use of a good conductor, this skillet provides even and quick heating. Aluminum is a lightweight material which is gone through the die-casting process to form durable and lightweight Delonghi BG45 Electric Skillet. This electric skillet also includes a removable temperature regulator to change the temperature according to your need. The highest temperature of this electric skillet is 400 degrees Fahrenheit. The lid of this electric skillet is made of tempered glass. The specialty of this lid is its knob. The knob of this skillet has an adjustable steam vent hole. This hole is for easy evaporation of the steam. You can open or close the steam vent according to your needs. This skillet is also dishwasher safe, after removing the temperature regulator, it is fully water immersible. The product is stylish enough to impress your family and guest by its appearance. No indicator light on the temperature controller. The Cuisinart CSK-150 Electric Skillet is the best oval shaped stainless steel skillet. It has a stainless steel body, non-stick cooking surface, temperature regulator and is dishwasher safe. The body of Cuisinart CSK-150 is made of die-cast stainless steel. TThe stainless steel body and shape of the skillet makes it very durable and attractive. The inner surface of this skillet has a non-stick coating. This non-stick coating ensures that no food sticks to the pan while cooking. Due to the non-stick cooking surface, you can cook your food in less oil. The shape of this skillet is oval and maximum side to side measured as 15 inches by 12 inches. This electric skillet includes a temperature controller. This controller can regulate the from warm to 450 degrees. This temperature regulator provides a constant temperature. The temperature regulator turns off when skillet reaches the chosen temperature and then automatically starts to reheat and maintain the temperature. This skillet also includes a tempered glass lid to cover the food. This lid has a steam vent hole for evaporation of extra stream. The Cuisinart CSK-150 is very easy to clean. You can wash it in the dishwasher after removing the temperature controller. This frying pan works on 1540 power to provide quick cooking and it is built to North American electrical standards. Oster Electric Stainless Steel frying pan is a temperature regulated frying pan which can be used to cook amazing dishes for various occasions. Also, due to its stylish body can also attract the guests at the gatherings. The surface of the pan is made from black stainless steel and sizeable enough to cook food for a big family. The black stainless steel gives it a perfect body to show off. 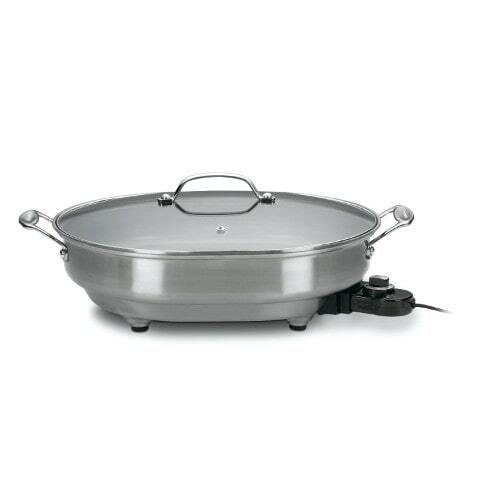 This stainless steel electric skillet by OsterIs is known for its big 16-inch X 12-inch cooking surface. 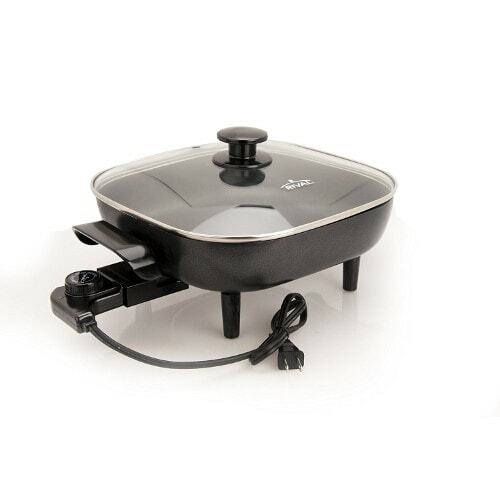 This electric stainless steel skillet from Oster has a temperature regulator to cook food at different temperatures. Hence allowing you to cook various dishes. This electric frying pan includes a transparent tempered glass cover with handle, which allows you to cook with a cover for certain special dishes. Hence allowing you to cook a variety of dishes. This Skillet is a fair buy for most of the customers with a big family. Cool-touch handles for easy transport. Temperature probe for easy temperature setting. If you have an intention to buy a steel electric frying pan, then this Aroma Housewares Skillet is a good choice for you. The frying pan of this electric skillet is made up of stainless steel which provides it high-capacity cooking. The stainless steel frying pan has even bonded base for even heating of pan to give the best result. It has a temperature controller to adjust the temperature from 225-degree Fahrenheit to 425-degree Fahrenheit to heat pan according to the dish you’re making in it. A tempered glass lid comes with skillet provide the full view of food, you cook in the pan. Thus, allowing you to judge if your food is completely cooked or needs any kind of stirring. The pan is very heavy and handles get heated. Proctor Silex 38526Is a small electric Skillet ideal for making family breakfast. It has a 12-inch X 12-inch nonstick cooking surface enough to cook four omelets together. This means next time you have guests over, the delicious omelets are definitely quick serves. A temperature probe regulates its temperature for appropriate heating of different food. The temperature regulator allows you to keep the food out of burns while cooking and allows you to cook healthy. This electric frying pan is dishwasher safe after removing the temperature probe. A dishwasher-safe glass heat is featured in the frying pan to keep your food safe and warm. This product is perfect for a small family. Unable to produce great heat. Dishwasher safe lid and pan. 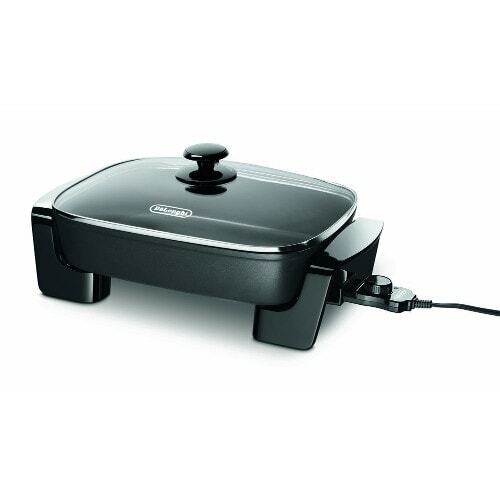 If you are looking for academic electric skillet, then Hamilton Beach 38528 Is my suggestion. This ceramic electric skillet is nonstick, and it’s cooking surface is sizable to 12-inch X 15-inch which won’t crack due to heat. Due to its ceramic body, it is free from PTFE and PFOA which makes it healthy cookware. The ceramic frying pan is 3 inches deep to fit any recipe in it. This ceramic frying pan includes a temperature controller to adjust the pan to any temperature required. The product includes a glass cover with a black handle for easy cover and opens when needed. Handles for easy transport are attached to the base of Hamilton Beach 38528. This allows you to easily transfer dishes in case of a large number of guests or at small family gatherings. This avoids a lot of hassle. 3″ deep to fit any recipe. 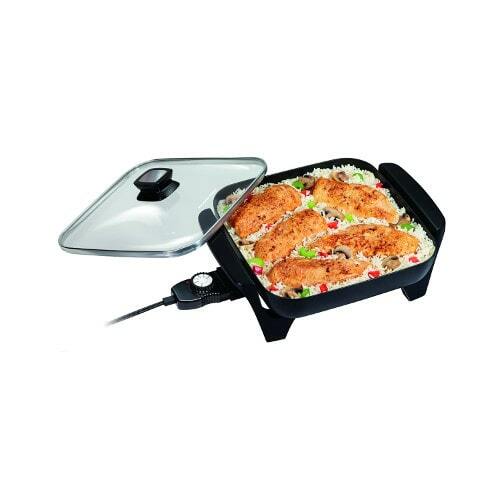 Rival Square Electric Frying Pan which also acts as a buffet server is perfect to have if you are a kind of party person or is a great organizer among your friends. The Rival Square Electric Frying pan’s cooking surface is non-stick and since it also acts as a buffet server, it is made up of stainless steel. 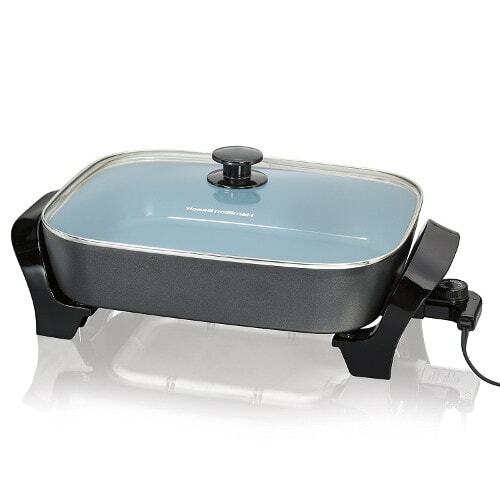 This electric frying pan has a glass lid to cover the pan and keep the food hot after cooking to serve it in the buffet. 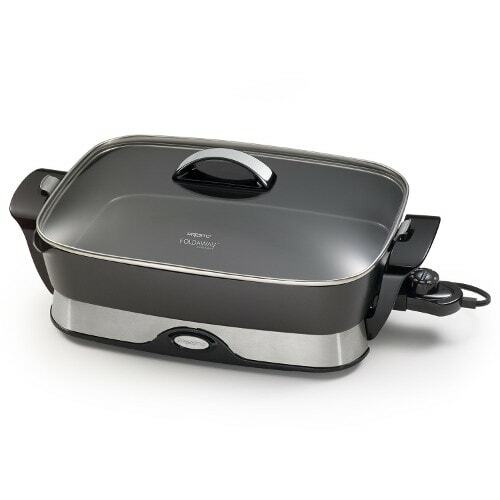 Rival’s electric skillet has two in one functionality; it can work as a Skillet as well as a buffet server. The Rival’s skillet has handles attached to its base to make a safe transfer from the kitchen to the buffet table. A removable temperature controller provided in the skillet features adjustable temperature for cooking and warming after removing temperature controller and dishwasher safe. Overall, this 11-inch X 11-inch spare electric skillet is a good product to have. You must select the best-suited skillet for you. 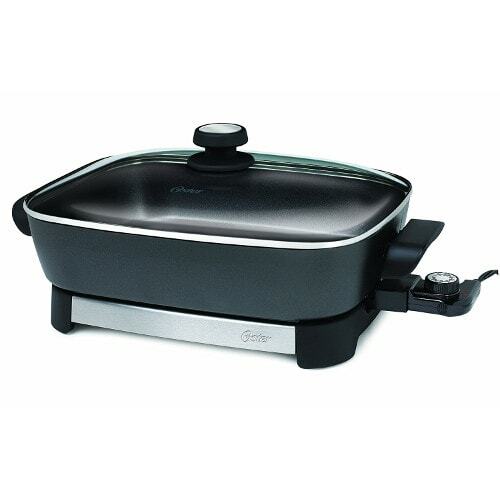 We have provided the best of the details of the available electric skillets.